Breitbart is reporting today that the Federal Reserve Bank of New York is reporting that businesses in New York have reduced their number of employees due to ObamaCare. Asked whether they were changing their health plans in response to Obamacare, three in five respondents — in both the manufacturing and service sector surveys — said they were. The most widely reported adjustments involved higher deductibles, increased co-pays, and higher out-of-pocket maximums for employees. 67 percent were increasing employee co-pays. Due to Obamacare, about 14 percent of manufacturers and 18 percent of service firms indicated that more employees are now being covered by health insurance; 2 percent of manufacturers and 8 percent of service firms said that fewer employees are now being covered. When asked if they were making specific changes to certain fundamental business measures, owing to effects of the Obamacare, “roughly 17 percent of service sector firms and 21 percent of manufacturers said they were reducing the number of workers in response to” Obamacare. The vast majority of respondents in both surveys said they were not changing the proportion of part-time workers that are ineligible for Obamacare. This is another example of the impact federal policies and regulations have on the economy. The American economy functions best when the free market is allowed to work–ObamaCare short circuits that process. We need a new administration in Washington that will lessen the burden the government places on Americans and American businesses. It is obvious that Hillary Clinton will be four more years of government burdens on Americans. At some point the economy will collapse under that burden. A vote for Hillary is a vote for the collapse of the American economy. ObamaCare is touted as one of the crowning achievements of the Obama Administration. Like some of the other achievements touted, the benefits are somewhat questionable. The two main promises of ObamaCare–if you like your healthcare plan, you can keep it, and if you like your doctor, you can keep him–have not really worked out as claimed. Now the claim that ObamaCare has cut the cost of health insurance seems to be in doubt as well. Forbes Magazine posted an article on Thursday disputing the claims of Loren Adler and Paul Ginsburg of the Brookings Institution that health insurance premiums have decreased under ObamaCare. The authors cite a 2014 Brookings study that concluded premiums have increased. While I will discuss the relevant evidence of the ACA’s effect on premiums in depth, there are three data points worth emphasizing. First, unlike Adler and Ginsburg’s approach, Brookings 2014 study used actual data and found that “enrollment-weighted premiums in the individual health insurance market increased by 24.4 percent beyond what they would have had they simply followed…trends.” Second, S&P Global Institute found that average individual market medical costs increased substantially between 2013 and 2015, up an estimated 69%. Third, 2014 insurer data shows that premiums for individual market Qualified Health Plans (QHPs), ACA-compliant plans certified to be sold on exchanges, were much higher than premiums for individual market non-QHPs, mostly plans in existence before 2014 that did not comply with the ACA. 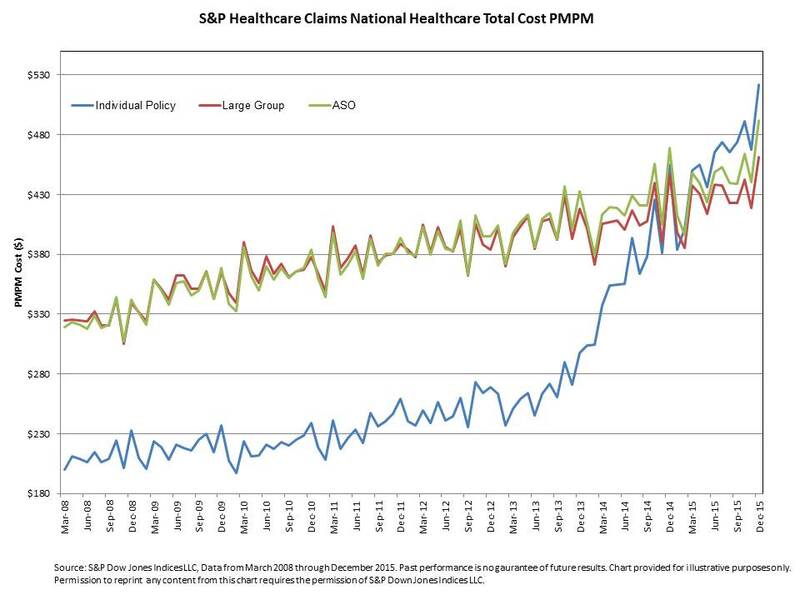 Relative to non-QHPs, insurers collected more than $1,000 per enrollee in higher premiums and more than $2,300 in higher premium revenue per enrollee in 2014 after accounting for large premium subsidy programs for their QHPs. …It is worth noting that the individual market includes both ACA-compliant plans as well as non-ACA-compliant plans. If only ACA-compliant plans were included in the post-2013 data, the spike would likely be much larger. I do wonder how much of this will be reported by the mainstream media. The fact that most people will experience this on a personal level means that the public will become aware of it. On Friday, The Federalist posted an article about ObamaCare explaining where we are and where President Obama would like to go next in American healthcare. It really isn’t good news. …Forcing insurers to cover people who are already sick and to charge them the same rates as healthy people has jacked up insurance premiums for everyone else. So because the law didn’t make insurance affordable, Congress has to make it affordable by heavily subsidizing it with even more of the taxpayers’ money. Obviously ObamaCare is not working in a way that is helpful to the American people. So what happens next? Don’t say you weren’t warned–you were. Like I said, this was predictable and predicted from the very beginning, but now it’s all out in the open. ObamaCare was always just an exercise in planned obsolescence, cobbling together a system nobody really thought was going to work, just so they could exploit its failures to push for the socialized medicine they really wanted all along. It’s telling that in this article, Obama boasts that the Affordable Care Act has increased the number of people who are insured, but his own data shows that the biggest driver of that is an expansion of Medicaid, which is not insurance but welfare—the system he wants for everyone. As I noted back in 2009, a decade-long exercise in deliberately wrecking private health insurance is the most callous and destructive way to pursue that goal. If that surprises you, look at Venezuela. When has the Left ever shied away from smashing everything to pieces in pursuit of government power? So we shouldn’t expect anything different here. If we are going to stop this runaway train, and it is not assured that we can, the only possible solution is to elect people in November who do not support socialized medicine. How do you find this people? You look at the voting records of anyone who was in Congress when ObamaCare was passed. You listen to the statements of the candidates. I have one final note. ObamaCare was passed through a budget reconciliation process rather than as a standard bill. This was because that type of bill could not be filibustered in the Senate. No Republicans voted for HB3590, the predecessor to ObamaCare, or the reconciliation. Senator Scott Brown of Massachusetts (who was voted in after Ted Kennedy’s death) never got a chance to vote on ObamaCare because the Attorney General of Massachusetts delayed the certification of the election until after any Senate vote would be taken. The shenanigans involved in passing ObamaCare in the first place were disgraceful. It is also disgraceful that the Republican House of Representatives has not made a serious effort to defund ObamaCare. We need to elect people who will end ObamaCare and bring the free market into healthcare. Then America will have a strong healthcare system that serves all Americans. The American Spectator posted an article today about the latest chapter in the ObamaCare saga. The article reminds us that the health insurance providers were initially supporters of ObamaCare. The article also reminds us that the insurance companies knew that they would not be able to make a profit under the rules of ObamaCare, but the plan was to have the taxpayers make up the loss. In Christopher Marlowe’s Doctor Faustus, the sinful sawbones eventually thinks better of his bargain with the devil and does his best to weasel out of the deal. A number of health insurers, having made similarly cynical arrangements with the Obama administration, are now attempting to use the court system to escape the consequences of their cupidity. Knowing full well that they couldn’t make legitimate profits selling coverage through Obamacare’s exchanges, they relied on Democrat guarantees that their losses would be covered by the taxpayers. But a funny thing happened on the way to easy profits. Congress refused to appropriate the funds. The insurance companies in question were told by the Obama administration that they could expect to have their bottom lines propped up by the “risk corridor” program. The magical thinking behind this boondoggle was that insurers enjoying big profits from Obamacare would pay into a pool from which less fortunate plans would be subsidized. In late 2015, however, the Centers for Medicare & Medicaid Services (CMS) announced that profitable insurers had paid in a mere $362 million while their unprofitable counterparts had requested $2.87 billion to cover their losses. Thus, the losers would be paid only 12.6 percent of their requests. In 2012 the Republicans took over the House of Representatives and in 2014 they gained a majority in the Senate. The House of Representatives failed to appropriate the funds. This is not an exaggeration. The restriction on using general funds to keep Obamacare afloat will drive the few remaining CO-OPs out of business and the remaining insurers out of the exchanges. Neither the Obama administration nor the congressional Democrats with whom they made their cynical deal can save them. In the end, the Devil will have his due. The obvious answer here is to reintroduce the free market into health insurance. Let competition lower the cost. Create a risk pool for people with pre-existing conditions, much like the auto insurance industry does. Allow competition across state lines, and have the insurance follow the person so changing jobs is not a problem. Provide tax deductions for the cost of health insurance–if you don’t pay taxes, you don’t get the deduction. Also, take twenty-five-year-old adults off of their parents’ policies–it is time for them to take responsibility for themselves! Investor’s Business Daily posted an article today about Donald Trump‘s plan to reform ObamaCare. Most Americans who have had to change doctors, had their health insurance premiums rise drastically, or had their deductible amounts skyrocket would consider almost anything on that front good news. As with most GOP plans, Trump would lift restrictions on interstate sales of insurance, thereby letting consumers shop around for plans in states that don’t impose a host of costly benefit mandates. He’d also expand Health Savings Accounts, the one reform that has been a proven success and a standard feature in every GOP reform, although he’s still vague on the specifics. To remove the tax distortions between employer-provided insurance (which is tax exempt) and individual insurance (which has to be bought with after-tax dollars), Trump would allow taxpayers to deduct the full cost of their individual premiums from taxes. The article goes on to explain that the changes would provide savings for wealthier Americans while not doing much for poorer Americans. However, since the wealthy pay more, you could easily make a case for that. This is a guy, after all, who bragged not too long ago that he was “very liberal” on health care, and who often talks as though he still is. The plan says nothing about Trump’s oft-repeated and absolutely horrible proposal to have the government negotiate (that is, fix) drug prices for Medicare. He is still completely vague about how he plans to cover everyone and “have the government pay for it.” And the plan doesn’t mention Trump’s stated support for ObamaCare’s “guaranteed issue” regulations. Which Trump would ultimately emerge is anyone’s guess. And, since Trump says that everything is negotiable, who is to say he wouldn’t start cutting deals with Democrats as soon as he gets the keys to the White House? Voters who want ObamaCare replaced with real free-market reforms are taking a big gamble if they think Trump is the man to actually make it happen. Don’t believe anything until the ink is dry on the President’s signature, whoever that President may be. Fox News reported yesterday that illegal immigrants and others whose citizenship status was unclear received up to $750 million in ObamaCare subsidies as of June 2015. The people who make comments like “that does not necessarily mean they’re ineligible” have obviously never raised teenagers. The Senate report states that it is doubtful that the IRS will be able to recoup the money as there is no concrete plan to locate the people who illegally took the subsidies. In a July letter to Johnson, IRS Commissioner John Koskinen assured that the agency is “committed to identifying and efficiently addressing” improper payments. He reiterated that anyone “not lawfully present” who enrolls for ObamaCare coverage “must repay” the advance premium credit payments, and would be breaking the law if they don’t. And the government has suddenly become efficient???? Do Bad Government Programs Last Forever? Ed Morrissey posted an article at Hot Air today about the recent enrollment numbers in ObamaCare. It seems that the program is not reaching the people it was designed to reach and is costing far more than the American people were told it would cost. ObamaCare will enroll significantly fewer people than expected in 2016, ending the year with about 13 million customers, the Congressional Budget Office (CBO) said Monday. …Similarly, subsidies that help people who meet income and other eligibility criteria to purchase health insurance through exchanges and to meet their cost-sharing requirements, along with related spending, are expected to increase by $18 billion in 2016, reaching a total of $56 billion. The politicians who designed ObamaCare (it was obviously not designed by healthcare experts) did not understand actuary tables or human nature. Young, healthy people do not consider health insurance a necessity and do not sign up for it. So far the fines have been cheaper than the insurance, so there is no incentive for young, healthy people to sign up for ObamaCare. Thus, you don’t have the young paying enough premiums to cover the expenses of those who are older or less healthy. Hopefully the 2016 presidential election will free us from ObamaCare. Forbes Magazine posted a story last Tuesday about what has happened to the North Carolina economy. The change began in 2013 (just before we got here). At that point the North Carolina General Assembly was controlled by Republicans and a Republican was governor. …Due to the reforms, however, the federal UI tax hikes were halted in 2014, and dropped back to standard rates after the debt was paid off last year. The result has been significant tax relief for job providers. …Today, North Carolina’s fiscal health is in far greater shape than it was in 2012, thanks to bold unemployment insurance reforms that will enable an additional $240 million in tax relief for state employers in 2016. For a roadmap to UI reform, states should look no further than North Carolina, where a crackdown on fraud has saved tax dollars and early debt repayment has enabled massive savings for job creators. The numbers above are helping draw additional businesses and jobs to North Carolina. I like that, but I also wish that other states would follow our lead. The five-percent plus unemployment rate in America is a joke–the labor participation rate is dangerously low. I am hoping for all Americans to have a chance to find the jobs they want. Following the example set by North Carolina would be a step in that direction. 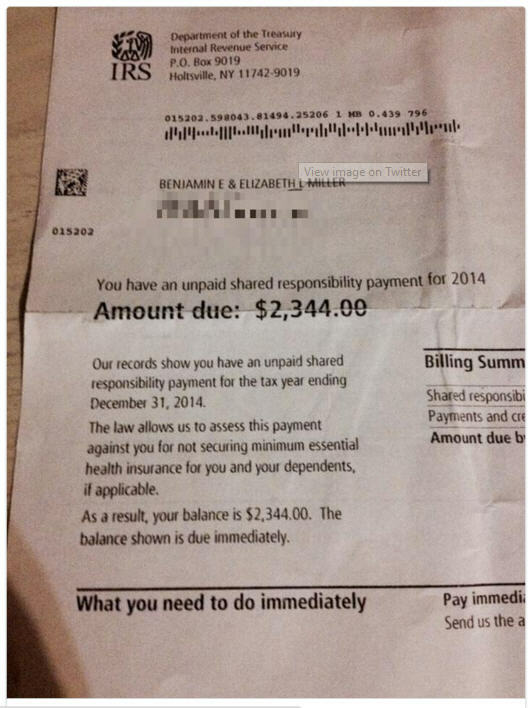 This is the bill that an Indiana man named Benjamin Miller received because he did not have health insurance. He failed to purchase health insurance because under ObamaCare his previous insurance was cancelled and his premiums increased by over $1,000 a month, which he could not afford. I guess I am curious how the government expects people who can’t afford health insurance to pay a fine for not having it. Notice that the penalty for not having health insurance is called an unpaid shared responsibility payment–not a tax. Also, think about this for a moment. If the man needs medical attention, the hospital is required by law to provide it. Because he has no health insurance and probably not a lot of money (because he couldn’t afford health insurance), chances are the hospital will lose money on the deal. Logically, the hospital should be the one getting the ‘shared responsibility payment’ because they are incurring the expense. However, in the true form of government overreach, the money from the ‘shared responsibility payment’ will go to the government to be lost in the abyss of government spending. If you ran a business that way, you would be arrested. How’s That Government Healthcare Working For You? On Saturday, Forbes Magazine posted a story about the current state of ObamaCare. Basically, the article reports that the government is not very good at running anything and should be discouraged from doing so whenever possible. Wasn’t ObamaCare the program the newly elected Republicans promised to get rid of if the voters gave them the House and the Senate in 2014? Then the Republicans elected the same leadership and the promise was broken. It is very obvious that ObamaCare is a bloated government program that is not working very well. It is time for some elected official to develop enough of a backbone to say that it should not be funded. It is time to end the Continuing Resolutions and actually act like men (and women) with principles and pass a budget. I realize that in defunding ObamaCare, Congress faces a Presidential veto and a government shutdown. Either one of these events should be laid at the feet of the President. President Obama is a failed President in so many areas, this might be the time to challenge him on another failed policy. Please follow the link to the Forbes Magazine article to see how badly ObamaCare has failed. Yesterday’s Washington Times reported that the Health and Human Services Administration has rewritten the rules in ObamaCare regarding birth control. Please follow the link above to read the entire article, but I am only going to focus on two aspects of the law. First of all–the Obama administration ordered all insurers. Insurers are asked to comply with a law that was never even considered in Congress. How does the implementation of this law represent anything the voters had any say in? Secondly, in what way is anyone in charge of implementing this law accountable to the voters? Has the government completely taken over the health insurance industry–telling them what they can cover and what they can’t cover? The Supreme Court last year ruled closely held corporations do not have to insure types of birth control that violate their moral beliefs, and the Obama administration is expected to update its rules soon. Religious nonprofits, meanwhile, are still pursuing their cases through the courts, arguing that the “accommodation” the administration designed for them still leaves them complicit in contraceptive coverage. America was established as a representative republic–our public officials are supposed to represent us and be accountable to us. ObamaCare is an example of what happens when a political class that is deaf to the wishes of Americans ignores the law. Meanwhile, members of Congress committed fraud to make sure that they and their staff were exempt from ObamaCare (rightwinggranny.com). It is time to reign in Washington and get back to government by the people. Was This What America Wanted? Yesterday Investors.com posted an article about the new ObamaCare insurance premiums and the expected enrollment in 2015. Just 9 million to 9.9 million people will be enrolled by the end of 2015, the Department of Health and Human Services predicted. That’s far below an earlier Congressional Budget Office projection of 13 million. Instead of a near-doubling of the exchange population projected by CBO, the White House’s estimate amounts to a 25%-40% increase vs. the newly disclosed 7.1 million tally as of October. It is becoming very obvious that ObamaCare is not working out the way the American people were promised it would work. Meanwhile, sometime next summer we can expect the Supreme Court to rule on whether of not the federal government is allowed to pay the subsidies needed to make ObamaCare work. Excluding subsidies, the lowest-cost bronze plan will rise 3%, and the cheapest silver plan will go up 4%, on average. The after-subsidy premium cost increase of the cheapest bronze and silver plans has to do with how the subsidies are calculated. As income rises, even just to match inflation, the amount paid in premiums before subsidies kick in goes up. Further, individuals will pay more for the cheapest plans, after subsidies, if the second-lowest-cost silver plan premium increases less — or falls more — than premiums for the lowest-cost silver and bronze plans. In 11 of the 34 cities, the subsidized lowest-cost bronze premium will rise by double digits, but the subsidized rate will be flat or negative in nine of the cities. So, in addition to not being able to keep your doctor or your health insurance plan if you like them, you will be paying more for what you do have under ObamaCare. The Washington Examiner posted an article today about the Obama Administration’s plan to bail out insurance companies in case of losses due to ObamaCare (see rightwinggranny.com). The part of ObamaCare that is impacted by this decision is the “risk corridors” program. This is the program that was set up because ObamaCare chose to ignore the concept of the actuary tables that insurance companies use to determine risk and calculate insurance premiums. Under ObamaCare insurers are required to offer coverage to those with pre-existing conditions and limited in how much they can charge older and sicker patients. Like it or not, insurance is a business. Insurance companies need a reasonable profit margin in order to stay in business. When the government skews the actuary tables and fixes rates, the companies cannot exist without government subsidies. Either the subsidies will be paid or America will quickly morph into government health care (we saw how well that worked with the VA). In practice, this ruling may not make much of a difference. There’s no guarantee that Republicans will invite a confrontation with Obama over this, fearing that it would allow Democrats to shift blame to the GOP for any premium spikes that would result. The GAO opinion is not legally binding, and the Obama administration could simply choose to ignore it. It’s also possible that this won’t be an issue at all if — as the administration has insisted — payments collected from the program will be sufficient to cover any insurer losses. But the GAO opinion does provide more fuel to the argument of Republicans such as Sessions and Upton that the ultimate authority for covering any excess insurer losses rests with Congress. Under Obamacare, the risk corridors program is scheduled to be operational for the 2014 through 2016 calendar years. Unless we elect a Congress with the guts to stand up against this raiding of taxpayer money to support a plan that will not work, we will continue to see government spending grow out of control and government take more and more control of our lives. Your vote counts in November. Think about who and what you choose to support. Corporatism is defined by Merriam-Webster as “the organization of a society into industrial and professional corporations serving as organs of political representation and exercising control over persons and activities within their jurisdiction.” It is a serious intermingling of politics and corporations. It is currently what we have created in America with the passage of ObamaCare. In its October issue, Townhall Magazine features an article entitled, “ObamaCare’s Illegal Insurance Company Bailout.” The article explains the role of major insurance companies in the writing of ObamaCare in such a way that regardless of the impact of ObamaCare, the insurance companies would not lose money. If the law has a negative impact on the insurance companies, they will be bailed out by the American taxpayers. …Obamacare’s authors created three programs to help socialize insurance company risk. Risk Adjustment: The risk adjustment program is designed to stop insurance companies from marketing or pricing their plans in such a way that they only attract healthy, and therefore lower-cost patients. The program accomplishes this by assessing the patient population of each insurer and then determining which insurers are covering healthier people and which are covering sicker people. The plans covering the healthy people are then forced to pay money to the plans covering sicker people. All transfers between insurance companies even out. Risk Corridor: The risk corridor program is intended to encourage insurers to price their premiums low by protecting them from losses if their patients turn out to require more care than anticipated. The program uses a complex formula to take money from those insurers that do not spend a lot of money paying for patient health care, and then gives that money to other insurers that do spend a lot of money on patient care. So where does the money come from if all insurers spend more money on patient care than anticipated? That is the billion dollar question. The article explains that according to the House Committee on Oversight and Government Reform, the Obama Administration is expected to make $725 billion in net payments out of the risk corridor program in 2015 alone. When you include the increased reinsurance payments, the bailout will top $1 billion. According to long-standing, federal rules, in order for Congress to properly authorize payment, both the directive to pay and amount, and the source of funds for that payment, must be identified. And while the risk corridor program does identify who is to be paid (the insurance companies), it never identifies where the funds should come from. This is neither free enterprise or market-driven. It is time to replace ObamaCare with something that respects the free market and puts patients and doctors back in charge of health care. We need portability of health insurance, tort reform, and risk pools (as are used in auto insurance) to equalize the burden among insurance companies. We don’t need government-run healthcare. Government healthcare benefits no one. We need to stop it before it is too late. When Do We Admit ObamaCare Is A Bad Idea? Yesterday the Wall Street Journal reported that the HealthCare.gov website had been hacked. Evidently the hacker uploaded malicious software. Ann investigation concluded that no personal data was taken, so theoretically, if you used the site to purchase your healthcare insurance, you should not have to worry about identity theft (at least from that particular site). The attack comes as the federal government and insurance companies prepare for open enrollment, which begins Nov. 15. It is likely to be seized on by Republican lawmakers, who oppose the law, in fall campaigns as another sign of the health law’s flaws. HealthCare.gov suffered from crippling technology problems when it launched in October, though the government has since improved the site. Taken with recent data thefts from J.P. Morgan Chase & Co., Home Depot Inc., and celebrities’ iPhones, the HealthCare.gov hack further underscores that large organizations haven’t yet mastered how to secure the troves of data they collect from consumers. The government has no business doing health insurance–that power is not given to them in the Constitution. We are going to reach a point in America when we have to decide whether or not the U.S. Constitution is the law of the land. We can either choose to follow it or not. I think that during the past few years we have seen the consequences of not following the Constitution–government and government spending are out of control and all Americans pay a price for that–in terms of finances and in terms of privacy. It truly is time to take back the country from the Washington elitists who have been running it for a long time. NBC News is reporting today that a Federal Appeals Court in Washington, D. C., has ruled that that the Patient Protection and Affordable Care Act, (ObamaCare), as written, only allows insurance subsidies in states that have set up their own exchanges. This ruling invalidated an Internal Revenue Service regulation that allowed subsidies in all 50 states. Thirty-six states did not set up the exchanges required by ObamaCare, so the federal government set up exchanges in those states. The court ruled that the federal government may not pay subsidies for insurance plans in those states. This is actually the problem with the law–it has been rewritten as we go along. Mandates have been postponed, the stay-in-your-home provision for the elderly has been dropped altogether, and exemptions have been handed out left and right. It will be interesting to see if another Executive Order promptly makes its appearance. One of the effects of ObamaCare (intended or otherwise) is the redistribution of wealth–it takes affordable healthcare away from those who already had insurance–some rates have gone up as much as $7,000 or $8,000 per year for people not eligible for subsidies, and provides subsidies for people with lower incomes (without demanding income verification). In one state, people whose incomes were well above the poverty level were eligible for subsidies, but one wonders if those subsidies will decrease after ObamaCare is fully operational. It will be interesting to see if this decision stands–it will wind up in the Supreme Court.